The Forum News Spaces & Design – The Country Club: What’s In a Name? Home / Dining & Events / Dining / Spaces & Design – The Country Club: What’s In a Name? Spaces & Design – The Country Club: What’s In a Name? A neighborhood restaurant in Bywater measures up to its name, yet still retains its flair for whimsy and frivolity after a year-long renovation. Tucked away into what was once a remote corner of Bywater, The Country Club has been a secret neighborhood gem since 1977. Built more than 130 years ago, this Italianate Raised Center Hall Cottage was originally the family home for Anne McAvoy and George B. Canby, but it has seen several incarnations since — from a boarding house to a dispatch hub for a local taxi service. After more than a century of alterations, add ons, adjacent property acquisitions, installations and Hurricane Katrina, The Country Club had ventured far from its original splendor. In an effort to elevate the overall feel of the establishment and offer a more sophisticated dining experience, The Country Club went through a year-long renovation managed by the capable and creative team at Ferrand Design. “We based our design off of the historical expectations of a house in that style,” says interior designer Lauren Ferrand. “We really just added the design details that were missing that would honor the history of the house.” Traditional architectural details, like custom crown molding, millwork, plaster ceiling medallions and wainscoting, were added throughout the interior — most of it created onsite by skilled, local carpenter Andrew Goodrow of Guild Carpentry. Though The Country Club’s name has largely been tongue-in-cheek, the ladies at Ferrand Design took the moniker’s teasing mimicry and ran with it. “If you were to tell someone, ‘Hey, let’s go to The Country Club,’ I think most people’s expectations would be a golf course or a card lounge, maybe a smoking room,” Ferrand says. “We wanted to embody that as well.” This ambiance is especially noticeable in the bar and lounge area where Goodrow created a walnut coffered ceiling, millwork, wainscoting and a custom wine cabinet to match the existing walnut bar. They also added custom round-back chairs and bar stools. Keeping in mind the historical elements and country club aesthetic, Ferrand and her business partner Ashley Bowman were also intent to retain the festive and whimsical aura that has been an integral part of The Country Club since its inception. Local artist Cindy Mathis was tapped to give each space in the club its own signature style through fanciful murals in vibrant colors. “The double parlor features grass-woven wall coverings with painted floral patterns,” Ferrand says. 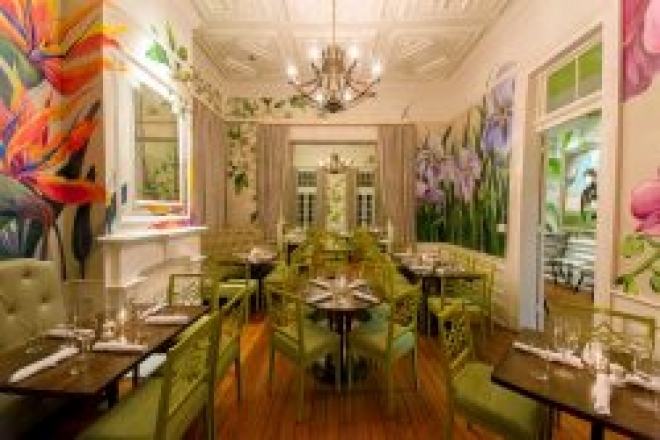 “Instead of the expected, small-scale pattern, we wanted to be a little bit more whimsical, so we said let’s do Jurassic-sized flowers.” A pandemonium of bright green Quaker parrots, a tropical bird oft seen all over the Greater New Orleans area, adorns the walls of the small parlor. “Their overall personality is representative of The Country Club,” Ferrand says. “They’re cute; they have a lot of fun; and they’re social.” A kaleidoscope of butterflies created by Mathis also grace the walls of the bar lounge, plus several portraits by famed Louis St. Lewis, including a “master of the house” portrait in the main entry hall.